Dina is 32 years old. She divorced her previous husband who lived out of the country and with him she had three children. One of them is in school, and Dina's three children live with her and her mother. Dina has worked in tailoring for four years. She learned this work in a class when she left to study. She started learning this skill and that is how she ended up doing work for her friends. However, she has also learned to do crochet work. She does this alone in her home. 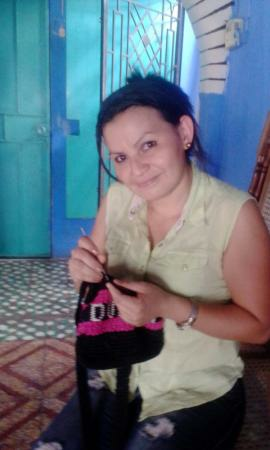 She needs the loan she is requesting to buy color thread and needles to continue with her crochet work. With the help of God, her dream is to be able to open a tailor shop and teach people who are interested in learning, since this is a very good source of income and she wants her children to have better conditions. She will achieve it with a lot of effort. Congratulations to Dina from El Salvador!